Obviously the first and most IMPORTANT thing to shriek at you is — I FINALLY HAVE THE RAVEN KING IN MY CLAMMY SHRIEKING PAWS. I waited so long for this. So so so so long. But never fear — I shall say nothing. BUT I AM AN ABSOLUTELY FRENZY OF EMOTIONS, OKAY?! ANYWAY! Books! Huzzah! Although due to being on hiatus for the first week of April, I got severely out-of-the-loop and ergo my link-sharing will be sparse this month. Also I haven’t blogged much. #slacker BUT I DID WRITE A BOOK AND THAT EXCUSES EVERYTHING. This are all library books. I KNOW. I HAVE A PROBLEM. But in my defence I had a whole bunch of reserves and they all came in at once. Because that’s just TYPICAL.Gah. Also half of these are brand new — ergo I’m the first one to read them — ergo HAPPY ME. STARFLIGHT: YAY ALIENS. I AM EXCITE. ANYONE BUT IVY POCKET: Because Kelly told me I was Ivy Pocket, so I need to see this for myself. TITANS: AND I CONFESS: this blurb sounds 99% like The Scorpio Races and I’m partially wanting to read it to see if it does rip off Maggie Stiefvater? And partially because I LOVED Fire & Flood. THE WAY WE ROLL: Sometimes I tell myself to read Aussie YA. So here I am. 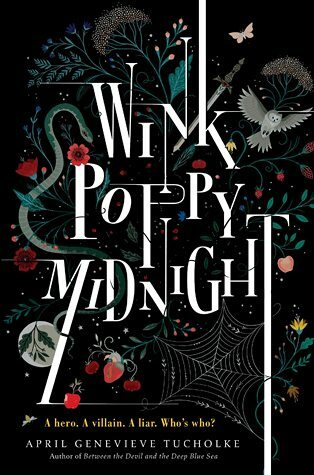 CREATURE OF THE NIGHT: I said “I want to read books about faeries” and Miriam said “Read this one” — SO HERE I AM ALSO. These are books I’ve bought & been sent for review. FRONT LINES: Thankyou Hardie Grant! And omg, peoples, something exciting is happening soon to do with a) Michael Grant, b) Front Lines, and c) my blog…VERY SOON. SHADOW QUEEN: I BOUGHT IT BECAUSE COVER AND FAIRY TALES. THE SQUARE ROOT OF SUMMER: Unsolicited from Pan Macmillan (thankyou!) and I have 0% clue what it’s about except probably maths. So I REMAIN DUBIOUS. N U M B E R R E A D? B E S T B O O K S? W O R S T B O O K S? D I S A P P P O I N T M E N T S? G O O D S U R P R I S E S? “what kind of writers are there” — Mostly insane ones. A few slightly psychotic ones. Just…well, approach a writer cautiously and maybe poke them with a stick before attempting conversation to see if they hiss. 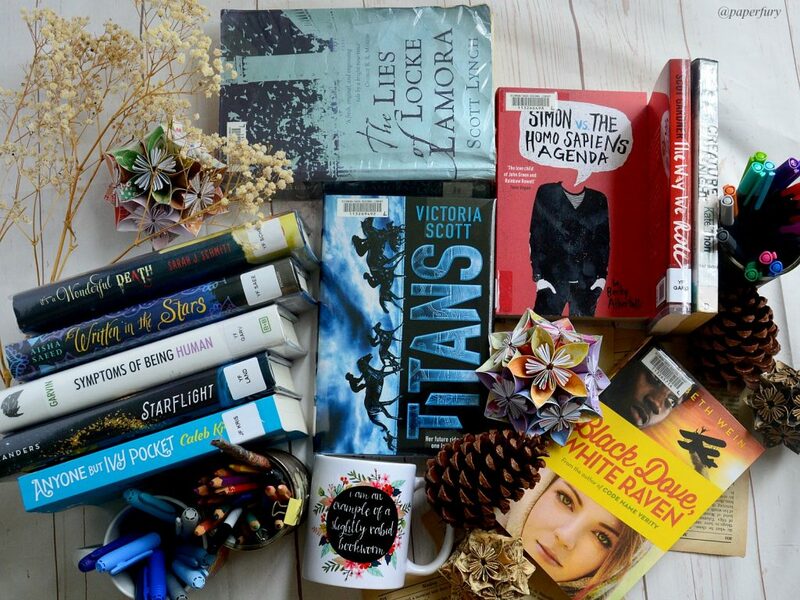 “why adults read ya novels” — Because some adults are AWESOME and do what they want. And also, I ASK YOU, definite “young” anyway. That’s between 14 and 94, right? “i’m not a creepy fangirl” — I am super glad to hear this. But if you’re asking Google to confirm this then…um, I hesitantly theorise that perhaps you are creepy? Maybe stop? “how to imagine have a good face” — Don’t look in the mirror and imagine positively. “i am a poor bookworm” — YOU AND ALL OF US. The term “rich bookworm” doesn’t exist because we’ve all spent all our dragon treasure on books. “trust me i’m not doing wrong with you” — Excuse me while I don’t believe you. At all. “side effects of reading novel countuisly” — Improved spelling, I hope. But I make no promises. “mare barrow vs katniss” — One is a complex, dimensional heroine who is the heart of a rebellion and loves deeply and has survived horrible torture…the other is Mare Barrow who is also a flat pancake. “how to attack people?” — MAYBE DOOOOOON’T???? It’s not nice. Make waffles together and talk it out, okay?! “how to know if he poke me in orchestra” — Probably get your musical instrument and poke him. Violently hard. Then glare and say “So how does that FEEL, HUH?!?! ?” and if he looks really super confused he probably didn’t poke you. Systematically do this to everyone in your orchestra. You’re welcome. “the five talented furious extraodinary devious” — This is probably another title for ME. “can i die because of fangirling” — Yes. Paper cuts. Heart exploding. Feels combusting. The fangirl life is super dangerous. All The Raven Cycle addicts MUST WATCH THIS FAN ART VIDEO. It’s incredible. I might’ve screamed. Plus if you’re on The Raven King withdrawal (aka me) go and listen to this fantastic song composed by Maggie Stiefvater. Here’s a short yet awesome interview with Cassandra Clare with her top tips for writers! Me likey. George RR Martin thinks some of his Game of Thrones side-stories and novellas could be TV shows. As long as he doesn’t write them, I suppose…SINCE WE DON’T LIKE WAITING 93 YEARS TO READ HIS STUFF. Aentee @ Read At Midnight has helpful tips about designing graphics for your blog posts! Aine @ Writing On a Vintage Typewriter has reasons you should take your own photos for your blog. Ava @ Bookishness and Tea has suggestions on how to read more! Avast ye, overwhelming TBR! Abbie @ Abbiee’s Music Blog has this AMAZING vlog about not confining ourselves to one talent if we want to run after a zillion of them. And it’s so great. Book: Here are so many NICE characters for you to admire & love. Enjoy! DID I MENTION THE RAVEN KING YET???? Basically it has rather consumed me. The countdown. The meltdown at realising my order from Book Depository wouldn’t arrive for 2 more weeks. The frantic signing up to audible to use the free first credit. The excruciating paaaaain of listening SO SLOWLY instead of racing through. (Mind you, I got that 11hr audio done in 3 days. I BE PROUD.) It made me thoroughly anxious and it was thoroughly worth it. Although I DON’T KNOW HOW TO FUNCTION ANYMORE. I also got sucked back into Supernatural. BECAUSE THOSE WINCHESTER BOYS. <3 I love this season! Except when Sam CRIED ACTUAL TEARS because he was so so scared in Ep 10. YEAH. NOT OKAY. Everyone is SO ENCOURAGING TO ME. Eeeeep. I have infinite thankfulness to everyone who read it!! Now I have to figure out my NEXT writing project. Either I a) write one of my 38398 ideas, or b) start editing one of my 38398 drafts. Nunnngh DECISIONS. Speaking of ideas…I have 2 new ones this month which I have to mildly talk about or I’ll explode. OKAY?! OKAY. One is about a boy who steals houses and is a contemporary and involves homeless children and farms and loneliness and probably copious amounts of waffles. The other is a Russian fantasy and involves an illusionist who is slightly mad and a king who can’t stop bleeding. I’m a little in love with them. I have this MASSIVE problem of being equally in love with ALL my stories. I need 9 more hands to type these…. CLEARLY READING SO MANY 5-STAR BOOKS IS INSPIRING. Also my TBR is officially so unruly I’ve just given up hope and am currently hiding from it. Remember when I said I only wanted 10 books on my TBR at a time? since i’ve been mildly out of the loop this month…TELL ME ALL THE EXCITING THINGS! did you hear any bookish news I should know?! what was your most recent 5-star read? any other Raven Cycle fans out there? COME SOB/FLAIL WITH ME. do you now feel like cheesecake? (…because I do…) and on a scale of 1 to Mt Everest, how unruly is your TBR???? I also have the Raven King audio. But I need to finish my current audio first because I can’t multitask audiobooks. *sorry between Shades of Grey* I read this amazing (non-fiction!) book called The End of Night, by Paul Bogard. It was about light pollution and so interesting. Hmm, my month has been frantic frantic because school is now over officially and I just have external exams (starting on Monaday eep) and a big project to do. (but because I’m awesome, I made my project about the power of fiction and storytelling in the context of censorship, so I’ve read lots of academic articles about that and now I know what phenomenology is?) My TBR is HUGE. I tried to go on a library ban, but failed. Still, I’m currently reading Lady Midnight and The Raven King and The Rose and the Dagger are coming up. (excitement!) Cheesecake is great. I love your story ideas! I wrote and edited like 12000 words of short stories, essays and poetry for a school award thing, so I’m pretty proud of that. yay for productive happy aprils. I can’t multitask audios either!! IT’s JUST…YEP. TOO HARD. 😂 Awgh, good luck with your exams. AND YAY FOR HOLIDAYS THOUGH, RIGHT?!? CHEESECAKE IS LIFE. MY FAVOURITE KIND OF CAKE. MATE, LIES OF LOCK LAMORA IS SO GOOD!! The plot twists are insane. Absolutely insane. I really hope you like it! I’m buying The Raven King this weekend, but won’t get to read it/ marathon the series until June. My body is not prepared. My TBR is extending into space. I’m about to collapse under it. Waa you had quite the eventful week! I am so happy to see you got Ivy Pocket because I feel like that book is you condensed into words – I hope you will love it. I personally adored Lies of Locke Lamora, it’s so wildly entertaining and filled with treachery and death and dastardly anti-hero so I think you’ll love it. I seriously need to start reading TRC QUICKLY before I get irrevocably spoiled by the tumblr’s many edits. More like month. 😂 I didn’t cram all this quite into a week, omg. hehe. BUT YAY AND THANK YOU. And zomg after Kelly saying I was Ivy Pocket and now you, I AM DOUBLY CURIOUS. I’m definitely going to read it ASAP. Also yayyyy about Locke Lamora then!! 😀 Treachery and dastardly anti-heroes are my FAVOURITE. I want to read Shadow Queen so bad, especially since I just finished C.J. Redwine’s Defiance Trilogy. But it’s not in the bookstores over here yet. Ugh. Now I will have to wait ages for Book Depository to ship. AGH LIBRARIES ARE THE DEATH OF US RIGHT?! I blame them for like 90% of my TBR troubles. And that time that I won 20 books last month. *facepalm* I LOVE BOOKS SO MUCH. But I’m definitely going to be crushed beneath them soon. 😂 At least if the apocalypse happens, we won’t be bored??? AHHH I HOPE I LIKE SHADOW QUEEN! I’ve heard some less-than-good things about it, but it has DRAGONS. What can go wrong with a book about DRAGONS?!?!? Gah I feel like I’m jumping from one novel idea to the next this month! First I had the Cheshire Cat (which I gave up on) then I had that one that I blogged about (which is making me tear my hair out) and I’m now trying to develop a second person story idea. Major fail in the writing side of things! But I’m SO SO SO SO SO SO SO excited because I won your giveaway for The Winner’s Curse! Ahhhhhhhhhhhhhhhhhh! I’m so incredibly excited to see them plop in the mail! I haven’t read The Raven King yet, due to the fact that I’m currently reading Blue Lily, Lily Blue AND ADORING IT. Also normally I would feel like eating some cheese cake, but I’m sick, which means I don’t want to eat anything. THIS IS VERY SAD. My TBR is *counts* 349 books tall, but that’s not including the Netgalley ARCS that I’m drowning in. AHFAJDSKALFD I AM SO GLAD YOU LIKE BLLB. I still think it’s possibly my favourite?! But The Raven King also just MELTED MY BRAIN AND I AM UNABLE TO FUNCTION. *shrieks* AHhhhh I loved Lady Midnight too. <3 And now I want to go sneakily google this Lily Anderson book because IT SOUNDS WONDERFUL. FANDOMS!!!! Ugh to being sick though. D: When one doesn't feel like cheesecake, one knows things are bad. Dude. You and me both with the mammoth TBRs. How do we liiiiiiiive. YESSS you must google(and then read) The Only Thing Worse Than Me Is You. I can pretty much guarantee it’ll land on your favorites pile. IKR. I must be really sick to not want to eat cheesecake, cause I love cheese cake. Especially mixed berry cheesecake. I had to read the Raven King in one night because that was all the time I had blocked out for it. It took me three days to actually sort it all out in my head though. A certain thing disappointed me (humongous spoiler so I won’t write it here), but I DID see it coming. What did you think about the sudden introduction of Henry Cheng? Like, I liked him, but I’m not one hundred percent certain why he was there??? My TBR is too big. And, after a week of “I MUST READ!” I’ve crashed into “…Must I finish this course book.” I blame the Raven King. Now that I’ve read it, I must process it. Yes. Let's blame the Raven King for EVERYTHING from now on. oh, also could you like send some inspiration/motivation my way so I can get back into writing my other Wattpad short story?? kay thanks. AFJAKDLSAD THE RAVEN CYCLE FEELS ARE REAL RIGHT NOW. SO REAL. *breaks down sobbing because mind has exploded* Also I totally understand writing taking over reading space…I can’t balance both. 😂 But eep god luck with YOUR wattpad story1! I’ll just package up some of my inspiration and send it (and some motivating cupcakes) to you via dragon expression post, eh? THAT SHOULD WORK. I CAN ONLY IMAGINE I AM SO EXCITED FOR IT. haha, Neither can I! And I keep falling into a rut for both?? And I have no motivation to do anything. Lol. I only read five books this month and it was trc and The Young Elites and The Rose Society. TYE was good but TRS was amaaaaaaazing! Sorry about all those abbreviations, I’m #lazy at typing. Okay, I better read TDBATC (is this correct?) before it goes away! I’m five chapters in and it’s awesome! Just a teensy doubt, how did Gansey survive the hornet’s? It still doesn’t make sense to me. And Adam and Ronan. Why do people ship them? It has something to do with Ronan saying that Adam was his second secret, right? I’m a clueless chicken, help. I got the Raven King in the mail earlier this week but I’m kinda scared to actually start reading it… Aaaah. Going on a vacation tomorrow so I’ll probably read it in 1 day haha. Also I need to start reading your watt pad story asap, love the other ideas as well! Omg THANK YOU ISABELLE. <3 I hope you enjoy my story. *chews nails nervously* 😂 😂 Ahem. BUT OH HAVE A NICE VACATION!! And I was so totally freaked of the Raven King...BUT IT WAS GOOD. GOOD LUCK. You got it! I’ve heard so many things about it and yet I’ve only read the Wolves of Mercy Falls trilogy. Yeah, I know, I’m so late. I will read the Raven Cycle! I love your designs by the way. They’re so beautiful! I want The Raven King so bad . . . I just finished BLLB the other day and oh storms. Lucky you to have gotten it already! Both of your new story ideas sound fabulous, but I like the second one better. And I will eventually read your Wattpad story . . . really, I will . . . but I do not generally go on Wattpad and so I usually forget. So jealous of your nine 5 star reads. That’s amazing! I just got all three Reckoners books because I think I should start there. They are shorter. The Way Of Kings is mocking me by taking almost as much space up on the shelf as that whole series in thickness. Oh it definitely won’t go away SOON. But it just probably will eventually? You’ve got time. 😂 And ajdflaksd thank you for wanting to read it though. MY HEART IS A SMALL SUNSHINE OF HAPPINESS RIGHT NOW. Ahem. Ohhhh, the Reckoner books are my EVERYTHING. *hugs them* I also own The Way of Kings and am currently avoiding it because it’s like…the size of a small PLANET. Halp. One day I definitely will. The Lies of Locke Lamora is awesome! Enjoyed it a lot. Pretty standalonish, so if you don’t like it, there’s no need to read the sequels. Which reminds me that I still haven’t got to them. 9 5-stars reads?! YOU GO, GIRL! It sounds like you’ve had quite the month. Yay for Supernatural. I don’t actually watch it, but you know that thing where you’ve never actually seen/read something, but you’re obsessed with the storylines and the characters and you love the characters to death? Yeah. That’s what’s happening. I just…SAMMYYYYY is a precious little moose and he must be protected. Gah, that show kills me. I am so stoked for the Series of Unfortunate Events to air on Netflix. That’ll be so awesome. I have the same writerly problems. I am currently writing 6 books at the same time because I CANNOT CHOOSE ONE!!! My most recent 5-star read is my new favorite book. It was The Girl from Everywhere, and I read it based on your review! It was so awesome. Nix was amazing, and I liked how her relationship with Slate developed, and Blake was just such a cute little character. I have never read the Raven Cycle, and I hadn’t even heard of it before I started reading your blog. I thought Maggie Stiefvater was a children’s author? That’s where all her books are at my library. I currently have one book on my TBR. I never have a problem with my TBR being too big, rather I never have enough books. I would much rather have a crushing TBR. AHHHH YOU READ THE GIRL FROM EVERYWHERE BECAUSE OF MEEEEEE?!?!! *flails for about 9000 years* THIS IS THE BEST NEWS OF EVER. Did you like Kash? I am in love with Kash. KAAAAASH. And I also want need a pocket dragon. Like, immediately. Ohhh, um, well Maggie Stiefvater has written one children’s book. No, wait, maybe two? Like for middle-grade sort of readers? Otherwise noooo her books are definitely YA. 😂 tHEY ARE MY FAVOURITE. I KNOW IT’S HARD TO TELL. I did like Kash a lot, but for some reason I liked Blake better. I thought it was so cool it was set in Hawaii! Next I am reading Under a Painted Sky, and I’m kind of nervous, but THE COVER IS SO PRETTY!!! OMG YOU MAKE ME LAUGH. YOU ARE WONDERFUL. <3 And I'm super pleased that you like these posts because I so enjoy writing them!! I haven’t read a single book you mentioned 🙁 I feel silly and out of place. And hehe, I envy your skills of taking living-things photos then!! 😂 I TRY SO HARD. But living things move, dangit. I love books because they just sit still nicely and do what I say. Ahem. Well. SOMETIMES. For everyone 1 photo I post, there’s like 93 deleted ones. hahah. I DO keep meaning to go read it, I promise! I just haven’t actually gotten to it yet. I HAVE NOT FORGOTTEN ABOUT IT THOUGH. I WILL READ IT I PROMISE. I bought the first three Raven Cycle books last year and have been waiting until The Raven King was released to binge read them. I haven’t read any Stiefvater, and your love for the series has me really pumped to read them! AHHHH I HOPE YOU LOVE THE RAVEN CYCLE THEN. *flails wildly* Her writing is just … omg I have no words. BECAUSE IT IS JUST THAT BEAUTIFUL. My most recent 5-star read is definitely The Blackthorn Key by Kevin Sands – idk if I’ve squealed sufficiently about it on here yet, but just in case I haven’t IT’S SO GOOD CAUSE IT’S SET IN TUDOR ENGLAND AND THERE’S MAGIC AND MYSTERY AND LOTS OF EXPLOSIONS AND POTIONS AND HIGH-SPEED CHASES AND IT’S LITERALLY THE BEST THING EVER . 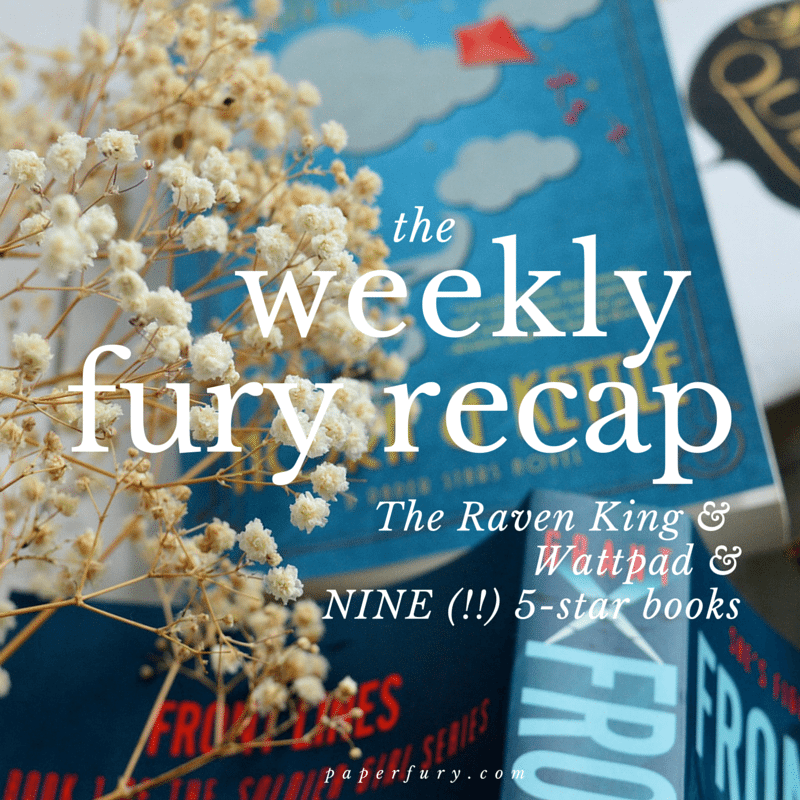 My TBR pile is like a solid eight?? Idk there are *counts* eleven books on it?? So it’s actually pretty calm compared to normal lmao. (It used to be like thirty.) I’m getting to the end of a bunch of really long series, so that’s helped decrease the size. Congrats on finishing your book! Omg I don’t think you have mentioned it yet! BUT I SHALL GO LOOK IT UP IMMEDIATELY. Because I’m always on the look out for amazing books…even if my TBR wants to strangle me in my sleep as is. 😂 I live on the wild side. THAT FANART VIDEO WAS SO PERFECT OH MY GOSH. Kavinsky! The Mitsubishis! Gwenllian waking up! The gravestone! ALL OF IT. So perfect. Oh my gosh. I guess at one time in one place I thought I had more to comment on than just TRC, but nope, TRC is everything. TRK FINISHED ME, THAT’S FOR SURE. I THINK IT JUST SLAYED EVERYTHING IN SIDE ME AND I AM NOW A TREE. And pfft, I know I’m going to rate a Stiefvater book 5 stars before I even pick it up. Am I worried about that fact? NOPE. AND AFJDKSLAD EXACTLY!! I think she succeeded exactly in what she wanted! BECAUSE I WANT MORE. And I love that she didn’t tie up everything in neat little bows, because when does that ever happen IRL? Not. And I mean, YES, there was magic and stuff in here, but the reason I loved it so much was because all the characters were so real. So I’m glad that they got REAL endings. And I think the fact that we GOT the disappointment that Gansey got is excellent writing. EMOTION. I HAVE IT. AND AFJDKLSAD TO THAT FAN VIDEO RIGHT. I CRY FOREVER BECAUSE IT’S SO BEAUTIFUL. :O I feel a little famous now because you screencapped my response to your wattpad story <3 (MinstrelWarrior here 😛 ). YOUR COMMENTS ON MY STORY ARE SO MARVELLOUS. <333 I APPRECIATED THEM A LOT, THANKYOOOOOOOU. YES! 5-STARS NEED TO BE SPECIAL! Or they lose their meaning, right?! AFKDSLAFD I’M SO GLAD YOU LIKED HALF LOST TOO. Everyone seems to be raging at it and here I am…hopefully in love. 😂 Ahem. And I totally get about needing to be in the mood. BUT I HOPE THE MOOD STRIKES YOU SOON BECAUSE THE RAVEN CYCLE IS MY EVERYTHING. *shrieks* And is there ever a time when cheesecake is not wanted? I think not. I HAVE heard of Queen of Hearts! I nearly requested an e-ARC but then decided not to because…TBR IS GONNA KILL ME. But omggg, it’s that good?! OKAY. I IMMEDIATELY NEED IT. HAHAHAHA THAT ORCHESTRA QUESTION !! The weird google searches is always my favorite section. 😛 WRITE THE RUSSIAN FANTASY. That sounds SO COOL. I’m just wondering, is it inspired by Rasputin and the Last royal family (the mad illusionist reminds me of Rasputin and the King that can’t stop bleeding is like the Tsar’s son)? But anyway IT WOULD BE AMAZING. EEEEP I really want to read Raven King but I’m going to reread the previous three books because I’ve sorta forgotten everything that happened …. AND YESSSS. YOU SEE MY INSPIRATIONS. Mwhahah. The Russian fantasy is going to be part Anastasia’s family retelling crossed with the Russian folklore tale “The Death of Koschei the Deathless”. Hopefully. It still needs much plotting BUT I AM EXCITE. OMG, congrats on finishing your Wattpad story! Also, your story idea for The Boy Who Steals Houses is wonderful and awesome and sounds like it would be so sweet and amazing. I think you should definitely write it! And I might be craving cheesecake now . . . . I TOTALLY UNDERSTAND. That’s exactly how I felt when I realised my copy wouldn’t arrive for TWO FREAKING WEEKS. *cries* Hence I broke and got the audible one because it was free and instant. 😂 Ahem. I TRIED to time my re-read to end in April, but I ended up finishing in March so I HAD TO GO A WHOLE MONTH WITH NO STIEFVATERING AND IT WAS TORTURE. *shrieks* Ahem. So yes. I completely understand the pain. I think outerspace is an excellent TBR measurement device. And of course!! I would rather stab myself in the eyeball with my laptop than give spoilers! BECAUSE I WOULD HATE IF SOMEONE DID THAT TO ME. *nods* I may review it on the blog?? But honestly, maybe not, too. 😂 It’s up on Goodreads anyway! Ah, it’s so cool to hear about such a fantastic week. Very inspiring *edges slowly towards the TBR*. One day soon, when I am not so broke, I’ll be ordering from your Society6 store because DAMN. The laptop cover and the iphone cover are on my to-buy list. In terms of reading, this month has been a bit stagnant. Today, though, I finished this pretty cool philosophical poetry-type short volume titled “The Prophet” by Kahlil Gibran. Mr Gibran likes to draw Rembrandt-style people despairing over their existential crisis. It was an interesting read. Alas I haven’t come across a cool five-star read since The Bane Chronicles. BUT. I’m reading Zen in the Art of Motorcycle Maintenance and it’s totally messing with my mind in the best way possible. I’m still not over The Lost & Found. I already can’t wait to reread it! Lol, are there are other Raven Cycle fans out there? You slay me. What’s the step above Mt. Everest? That would be my TBR. I should not be allowed to write comments when I’m this tired. I have no idea what I’m even saying anymore. Both of your new book ideas sound fantastic, as always. (Is it awful that I’m frustrated about the library sticker on Simon Vs?!? GAH. I won a copy last month apparently…but it never arrived. Which makes my small heart break.) OMG. I didn’t realise Locke Lamora was on hoopla. I may actually go that way instead. 😂 Audios are so much kinder on my brain. Um, sooooo, sHHHHH. 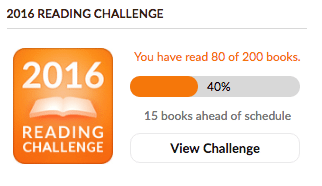 No one else has commented on my 20 books for 12 months NOT equalling 200 😂 😂 I’m only subtly overachieving. Very subtly. Mt Everest and then…STRETCHING TO JUPITER AND BACK? < -- That must be the next category. YOUR COMMENTS ARE ALWAYS FANTASTIC. I'M SMILING SO MUCH RIGHT NOW. Hahahahaha, oops, I didn’t mean to reveal your secret. Sneaky, sneaky. Can I make it STRETCHING TO SATURN AND BACK? I’ve always wanted to visit the rings. Yes you may have Saturn. The universe is your oyster. You can even have Mars if you can handle Darrow & Co. I wrote 76k in 22 days, so I’m a little dead right now. *flops* Oh! But the book a friend and I are writing is close to the end and we’re planning another! ACK! Thank you so much! Yeeesh, I’m so tired. I SAW STARGIRL IN YOUR PILE OF NEW BOOKS!! I recommend you swallow star girl whole like I did a few years ago, and love it, just like I did. As for my TBR it’s practically scaling to outer space, not amount Everest. I have about 7283939473 books I have to read (I have the actual copies) and 3984746482 I want to read (I don’t have the copies… yet). I’m really happy you liked Lady Midnight! I honestly didn’t finish it because of a lot of reasons, one of them being Emma (that’s her name, right?). I didn’t like her character, but hey that’s great other people enjoyed it like you! Omg THANK YOU. I’m really quite in love with the idea. :’) AND YELLOW. Apparently pinterest decreed it would have muchly yellow. hehe. Aww, I’m sad you didn’t like Emma. But books are subjective, OF COURSE! I completely understand. I pretty much failed at writing last year. 😂 So I’m TRYING to be mega-productive this year. ;D I hope your muse returns!! I’m currently reading The Dream Thieves, but I can still understand your mad love for the series! I just love the way Maggie writes. I need to read ALLLLL her books. Wow! That’s awesome you’ve read so many 5-star reads lately. I didn’t really like The Haters either. It was okay, but not all that great (at least for me sigh). FDJASLKFDA ISN’T HER WRITING JUST THE MOST BEAUTIFUL IN THE HISTORY OF EVER? I COULD SOB WITH IT’S GREATNESS. *proceeds to sob anyway* And zomg I have NEVER had this much luck with reading! It’s so so exciting! Ugh, the Haters was just too crass and plot-less for me. I mean, what did they even achieve by the end?!? Gah. True story: Every time I saw “Raven” and anything I covered my eyes and yelled “shhhhhhh I CAN’T KNOW ANYTHING” hhahaah. I really need to binge the rest of that series before I get spoiled. It’s going to happen. I am SO glad that you loved Half Lost. I ummm did not, but I am glad you did! Also sad that you hated The Glittering Court. Because I loved it, and what if we are becoming like, reading opposites?!?!? That would make me the saddest bookperson EVER. Ever. Also ummm I feel like that person with the poking in orchestra was talking about a different instrument. Or my mind is in the gutter, not even sure which. Both, maybe both. ALSO- how do you do so many things in just 30 days!? I am over here trying to come up with ANYTHING to tell people other than “man, I am tired, don’t know where the time went…” and you’ve written books and created bookish ,merchandise, read 38489 books, cured cancer, achieved world peace, and stopped global warming, and that was all during the first WEEK of April 😂 Seriously, you actually deserve to rule the world and make us your loyal subjects, because frankly, you manage your time wayyyy better than I ever could bwhahah. DON’T WORRY I WAS DOING THAT TOO. 😂 The worry of spoilers is REAL. Which is why I reeeeally tried not to say ANYTHING here. 😂 I mean, I kinda did. But. No details. Noooooo deatils. *nods* AhEM. Your posts are always helpful AND WONDERFUL. I am almost always shrieking with laughter. JUST SAYIN’. I did read your review of Half Lost…eeek. I get why you (and a lot of people, I’ve noticed!) are unhappy, but I still think it was the perfect ending for them. And it was REALISTIC. To me. War that plays favourites is too convenient, ya know? BUT OMG DON’T LET US BECOME BOOK OPPOSITES. *WAILS* I bought Nora & Kettle so hopefully we twin on that one right?!? WELL, YOU KNOW, I DO HAVE MY DRAGON SECRETARIES. *flips hair* All this productivity will crash and burn if I don’t remove myself from binge-watching Supernatural soon. ahem. BUT I’M ALMOST CAUGHT UP. Then I can go back to, ya know, establishing colonies on Mars or whatever as well. I UNDERSTAND THAT FEEL. *cries* The worst thing about library reserves is they always come at once. I’m sure the librarians do it on purpose so they can sit back and cackle at our pain. THE BOOKWORM LIFE IS SO TOUGH. I already have The Raven King and The Rose and The Dagger but I’m NOT EMOTIONALLY READY for them. I know they’ll rip my hearts out I just want to hold them off as long as possible (even though most of the times I just staring at the covers wanting to read them). Also Lies of Locke Lamore sounds really awesome, I’ve been eyeing it for AGES but never actually read it, so really excited to read your review (if you’re going to post one). I hope you’ll read even more 5-stars books next month! CAIT. I demand a Raven King post right nao. I must know your thoughts, etc. Thanks for all the lovely post links. I’m going to go check otu some of the featured blogs and their awesome posts. Yippee! I totally understand what happened to you with the library books. I do the same, like, just pretty much every week 🙂 BUT they should forgive us because it is like we are taking the books out for some fresh air too! YES. It’s so suffocatingly exciting! I GET SO ENTHUSIASTIC ABOUT READING WHEN THIS HAPPENS. *flails* Sadly it doesn’t happen very often. Gah. Ahem. I still haven’t read anything by Maggie Stiefvater (shocking, I know, BUT I’M READING HER BOOKS THIS MONTH, OKAY?) but because you got SO excited about The Raven King I lost my cool, headed to the bookstore and bought it. CAIT. I DON’T EVEN OWN THE OTHER BOOKS YET?! WHAT HAVE YOU DONE TO ME??? FIVE YEARS oh my gosh. *gives you a trophy* you deserve all the prizes for such an achievement. AND RUSSIA. STEALING HOUSES. These sound wonderful and I want to gobble them up. DUDE HOW DO I EVEN HAVE BLOG POSTS AND THINGS TO SAY AFTER 5 YEARS?! I DON’T KNOW. I’m finally reading (took me long enough). I just started The Untimely Deaths of Alex Wayfare, which I’ve been waiting for since June of 2014 when I read the first book in the series. Wouldn’t it be nice if my first read of the year was a good one? It makes sense. 😂 TBRs are such dastardly and dangerous things…and yet we persist on feeding them. *feeds mine cake* *watches it grow* Ahem. And YES. The search results are at the same time hilarious and depressing. The typos I find are insane. No one really has cause to be that bad at spelling these days. There’s spellcheck for one thing. Common sense is always nice too…AHEM. OMGGGGGG. THIS MAKES MY DAY. <333 THANKYOU. Also, FYI, Titans is totally a Scorpio Races rip-off. But not near as good. Bleh. I HOPE YOUR COPY OF THE RAVEN KING HAS ARRIVED YET. MY COPY ARRIVED AND IT’S BEAUTIFUL AND I HUG IT. 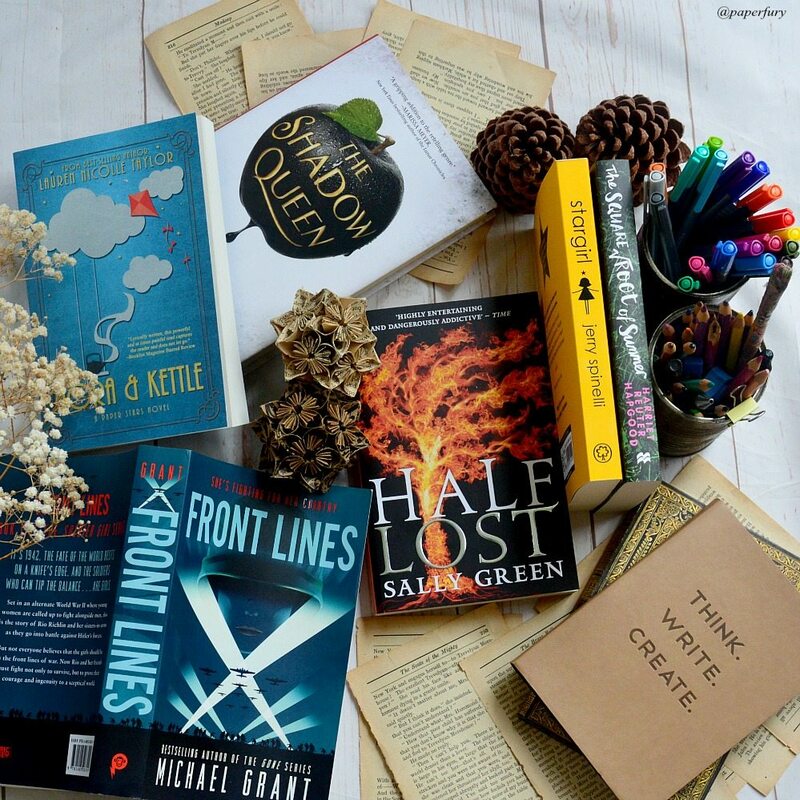 So many books in one post that I MUST read!! How am I supposed to read them all? Should I stop sleeping?! LOL! I’ve been reading The Winner’s Kiss, but I’ve had some issues getting into it. Ugh, I hate when characters lose their memory. I find it so annoying and cliche, but I just need to power through because I loved the first two books! That is crazy – I read Stargirl when I was in high school! I remember enjoying it though! I sent The Square Root of Summer to Jenna, it kind of reminds me of Falling into Places. I’m glad you enjoyed so many books this month, I need to catch up with Raven King already! I wasn’t a fan of Dreaming the Enemy either, it was just so fuzzy and hard to read. I did find TITANS was so close to Scorpio Races so it made me uncomfortable about the book. YAY FOR SUPERNATURAL – One of my favourites! Congrats on finishing your Wattpad story too. Remember Cait, you deserve all the encouragement! YES!! I read Maniac Magee and SO SO LOVED IT…so this must be a re-print. 😂 Which is kind of cool, getting those older books back in people’s hands, right?! Congrats on turning FIVE! FIVE!! Can you believe it has been this long? Whoot! HEHE. I quite like seeing what weirdness people come to my blog via. 😂 THEY ARE SO RANDOM, RIGHT?! Ahem. MUST. BUY. THE RAVEN KING. Omg Cait everyone is making me so excited. EEP. Except uni is eating me. I’ve done 3 assignments out of 9 for the semester. 6 weeks left and 6 assignments (except of course they’re all due at once). AND OMG I’ve wanted to read Stargirl for aaaaaaages. Maybe Hachette doesn’t love me enough *sobs* But I read The Square Root of Summer recently, actually. Way too smart for me. CAIT I JUST READ THE DEAD BOY AND THE PAPERCUT AND NOW I MAY HATE YOU. also does Thomas turn Two Incorrigable Lives into The Dead Boy and the Papercut? Also where is the paper cut in all of this? also WHAT HAPPENS TO MY POOR DARLING THOMAS?????? OMG THANK YOU SO SO MUCH FOR READING IT THOUGH. I AM REALLY INTENSELY FLAILING FOREVER NOW PROBABLY. AHHHHHH. This sounds like it was an AMAZING month for you Cait! I mean…nine five star books? That’s incredible! And I am so glad that you loved The Raven King so much – I know how much you love Maggie’s books and I am so happy you found it to be a satisfying conclusion to the series. And I am so excited to see what you think of Starflight! It’s been one of the better books I’ve read this year, and it kind of reminds me of These Broken Stars in a way. But I have a feeling you’ll really like it. My Goodreads TBR is 3000+ strong. I’m guessing that’s to the moon and back? My physical TBR is only 45 books (Praise the Lord) and currently in a different country. I’ve been stuck with the terribly-stocked-with-English-books-library in a small town in Spain, but I make do. Thank God for Kindles!!! Go for the Russian fantasy idea. That sounds very cool. Also, I’ve finally moved to self-hosted. Would love it if you could check out my new site. It was scary, but I’m ultimately very happy with the decision. You have definitely outdone Level Mt Everest. 😂 GOOD LUCK WITH YOUR TBR!! And even 45 on the physical one is kind of intense right?! Mine is like 50+ and I’m dyyyyying. Runs off to go read it! People come to my blog via the WEIRDEST means. 😂 WordPress is awesome for collecting stats like this. hehe. Now I feel slightly pressured to switch over because everybody has WordPress now and like nobody has Blogger. Lonely me. So, funny (NOT) story… my internet died again for another WEEK (a.k.a. two whole weeks internetless) and only just came back so I am once again Cait-deprived. I’M IN WITHDRAWAL I TELL YOU. CAIT POSTS ARE LIFE. <3 Needless to say I adored this post, as I always adore all your posts and particularly your ginormous weekly fury ones. <3333 I also have ten billion things to say about it and can't remember them all so I will just try to be quick. I'M SO GLAD YOU HAD SO MANY WONDERFUL READS THAT IS GLORIOUS I'M SO HAPPY FOR YOUUUU. EEEP 5 year anniversary = awesome! 😀 THAT IS SO EXCITING. I’M SUPER EXCITED FOR LOCKE LAMORA! Although I realised the library has an audio too? So I might end up going that direction so I don’t have to be terrified by the sheer size. #wimp 😂 But yesss to heists and criminally books. I LOVE THEM SO MUCH IT’S PROBABLY A WORRY. *hi fives for level Mt Everest TBR* WE ARE IN THIS DOOM TOGETHER. I CAN’T BELIEVE IT EITHER HONESTLY. 😂 Usually I’m SUCH a picky reader! But I feel like maybe I saved up a bunch of books I knew I’d like and I binged them all and <333 PERFECTION. So many good books have been coming out lately! I’m in the middle of Lady Midnight and I am loving it! I’m beyond excited to start The Raven King and Half Lost! Wow, NINE five star reads?? That is AWESOME! I am so crazy picky with my five stars. I give out plant of fours, but not as many fives. I can’t remember the last time I gave that many five stars in a row. Insanity. I just read 100 days of cake and I was a bit disappointed too. I wanted more cake. I think I gave it three stars on Goodreads. “Me: Oh I like this character. Character: *dies*” MY LIFE. A boy who steals houses??? Color me intrigued. Pleasepleaseplease share as you write. Any little scrap will do, please and thank you. I got horribly behind on TDBATPC, BUT I’M LOVING IT. Plus now I can binge-read rather than wait for new chapters and then cry when I got to the end. Now I just get to cry once it’s all over. Tears will be happening, I can guarantee it. ISN’T THIS SEASON OF SPN AMAZING?!?! I’m still dying over the last episode. All the feels, alllll oooof themmmm. Also: HECK YES this season of SPN is amazing. I didn't hate S10 or anything, but I felt like it didn't do AS MUCH as it could've with the awesome developments. Like, seriously, I wanted Dean to become king of Hell for a while. 😂 Idek? I just think they could've done MORE with his demonness. Ahem. BUT AJFDLAKSD I'M GLAD THAT THIS SEASON IS SUPER AWESOME AND THE BROS ARE GETTING ALONG AND AFDJKALSDJ. Eeeeee, don’t thank me, I should thank you writing it!! Oh, I KNOW. I was happy that it was over, but also not, if that makes any sense. There was just so much set up and hype and then . . . that was it. Some karaoke and punching a couple guys does NOT count as being an awesome demon. Ahem. It’s turning 8 this July! Which I still kinda can’t believe. Like at all. Ack, I’m sooo behind on your Wattpad story! Please don’t take it down until I have the time to read it, because it’s awesome and I need to finish it (although, those comments have me a little worried about the ending…). Bahah, YES. I did do a lot. 😂 #overachiever ahem. But omg you’re reading my story?! *FLAILS MADLY* Thankyou so so much!! AHHHHHH. THE RAVEN KING IS EVERYTHING. *whispers* I think I”m getting a tattoo of the doodle Maggie put in the books. And when I say “I think” I mean, I’m totally getting one. Thank you for sharing all of your awesomeness. As always, your IG photos are gorgeous and you had me cackling while reading your post.